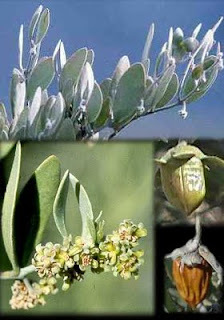 The PCRWR has planted Jojoba on three hectare desert dune land at Dingarh Field Research Station in the Cholistan desert to test its establishment in the desert condition under conjunctive use of rainwater and moderately saline water having EC= 4.6 dSm-1, SAR = 14, RSC = Nil and pH = 7.5, while rain water quality is EC = 0.58 dSm-1. About one hundred plants are eight year old and have attained height about six feet. These plants are bearing fruit, while the plants on three hectares have been planted recently. 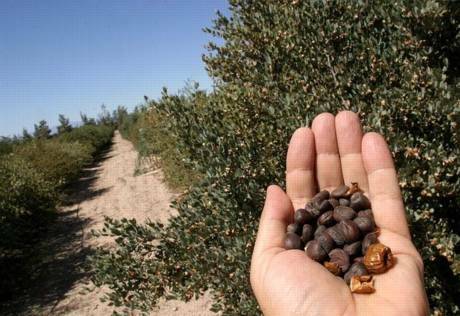 Jojoba (Simmodsia chinensis (Link) Schneider) is a perennial woody shrub native tothe semiarid regions of southern Arizona, southern California and northwestern Mexico. Jojoba (pronounced ho-HO-ba) is being cultivated to provide a renewable source of a unique high-quality oil. It is a bushy tree and grows mostly between 2 and 4 metre height and its roots may go up to 20 metres in the porous soils. The stature of the plant may go up to three metres. The natural life span is between one hundred and two hundred years. It becomes young within the age of 7 to 10 years and start fruit bearing at the age of three years after plantation in the good climatic and soil conditions. The oil content in its seed is more than 50 percent. The plant colour remains light to dark green throughout the year. 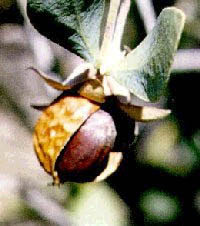 The Jojoba fruit is a capsuel that takes about six months to mature. 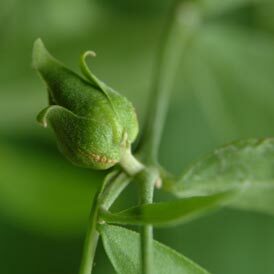 Jojoba seed contains a light-gold colored liquid wax ester which is the primary storage lipid of the plant. This is unlike conventional oilseed crops, such as soybean, corn, olive, or peanut which produce oils as the primary storage lipid. Jojoba wax (called oil) makes up 50% of the seed's dry weight. The physical properties of jojoba oil are: high viscosity, high flash and fire point, high dielectric constant, high stability and low volatility. Its composition is little affected by temperatures up to 570�F (300�C). Jojoba oil contains straight- chained C20and C22 fatty acids and alcohols and two unsaturated bonds, which make the oil susceptible to many different types of chemical manipulations. The extracted oil is relatively pure, non-toxic, biodegradable, and resistant to rancidity. arid zone Jojoba plantation in Pakistan.jojoba oil.